Learning after school at our house has to be fast paced and fun. 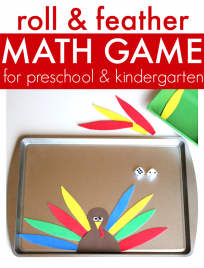 These math games are both. 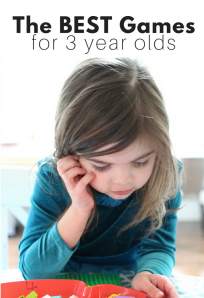 They are also a cinch to make and frugal too. Subitizing is the ability to recognize an amount without counting. It’s not a skill most of us were specifically taught in school but in recent years it’s been added to most elementary math curriculums. As the name of my blog suggests I am not a huge fan of flash cards but for some things that require automatic recall they make sense. 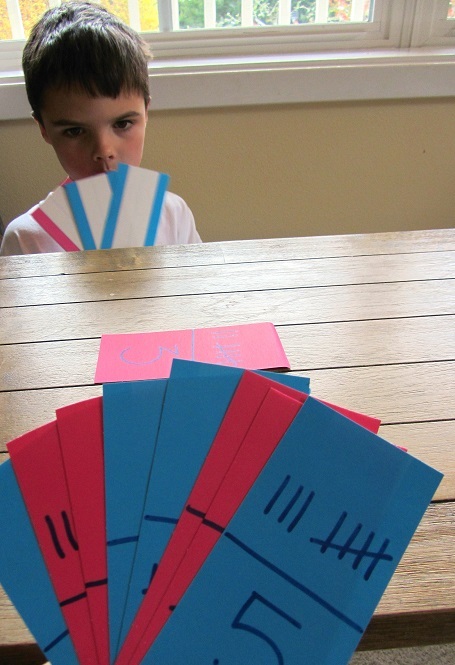 Subitizing is one of those skills that requires automatic recall but flash cards aren’t the only way you can work on the skill. Games like these are great too. Gather your materials . 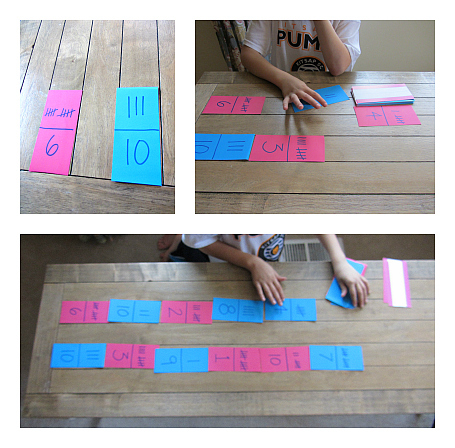 You will need some sentence strips ( using the back side) , scissors, and a permanent marker. 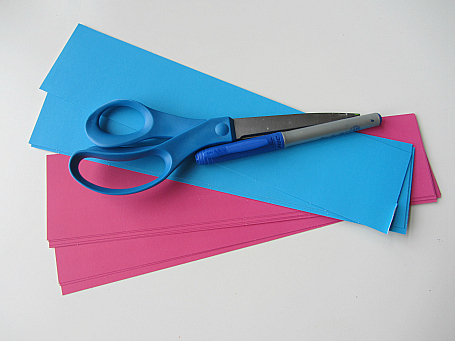 Cut your sentence strips in half. I used 2 colors but you don’t have to. 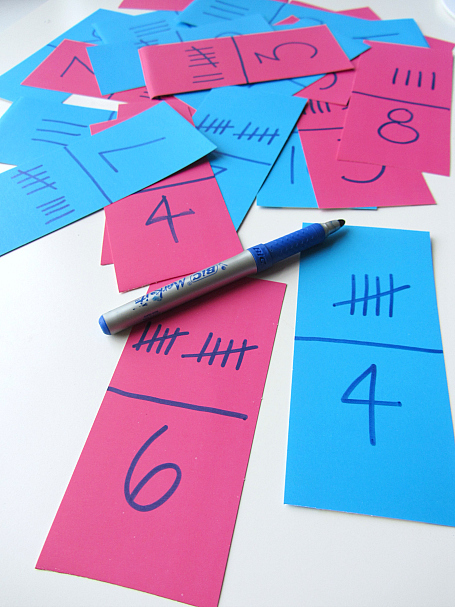 Draw a line down the middle of each card and a tally mark on one side , number on the other. These should not match. Let the marker dry completely before playing. The first game we played is a variation of dominoes. We placed one card on the table and split the others among the players. 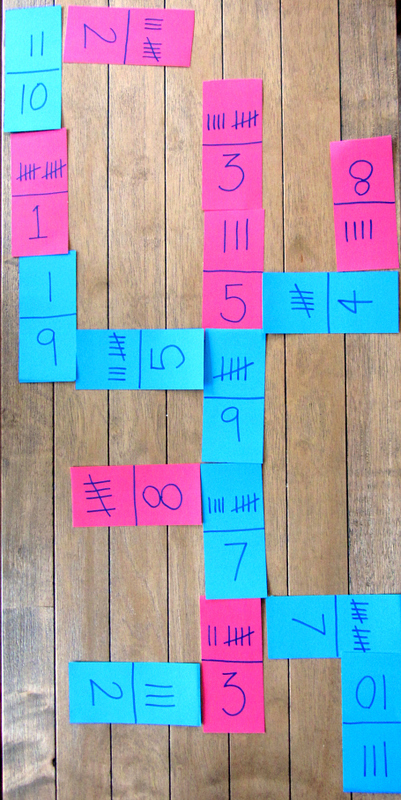 Then we took turns building by matching up the tally mark amounts to the numbers. The first person that had all their cards down won. The next game was my son’s favorite. It’s a head to head speed game. Here are the instructions: Shuffle the cards. Place two down so the tally mark is facing the finish line ( in our case the end of the table) . Place the other cards in a pile face down and flip. When a match is made place it down end to end and keep going. The first person to reach the finish wins. 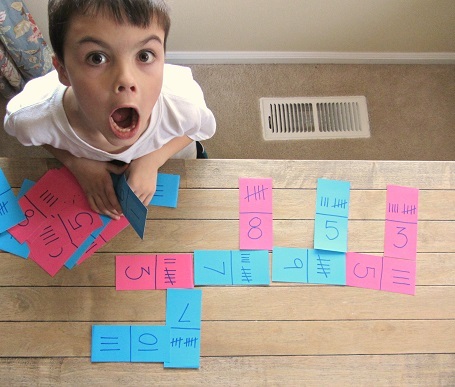 Practicing math at home does not need to be extra worksheets all the time. 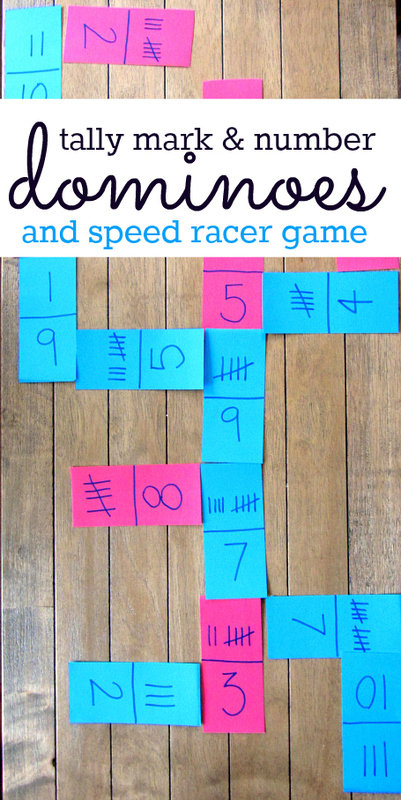 Make these simple games and you can play and practice at the same time. I love how much he loves this activity! We’ll be working on a set of our own this coming weekend, thanks to you! 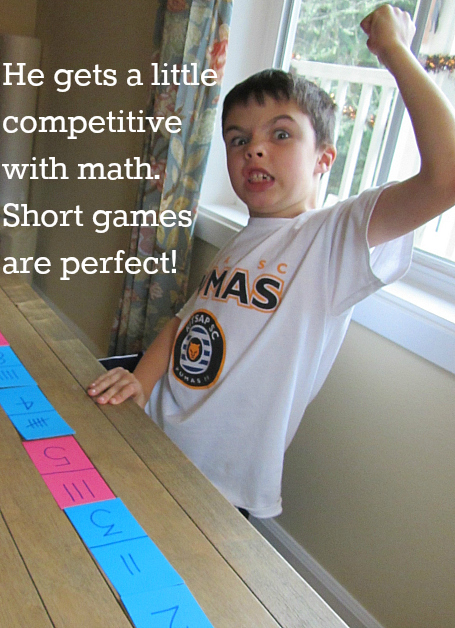 Not only do I love great homemade games but these pictures are fabulous. I have 7yo twin boys, a 6yo stepson, 4yo daughter and am 11 weeks along so have been trying to find some things to do with the kids other than snap and shout through the tired, cranky days so I am really excited about these simple games as well as the Fill The Blanks story and I am collecting more. 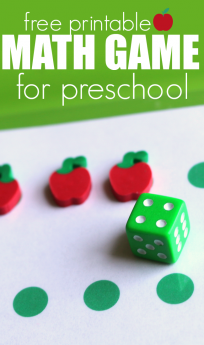 I haven’t had much time sitting around in silence to read through any blogs lately but today, I happened across this site and feel motivated to get my A into G and do something fun with/ for my kids.